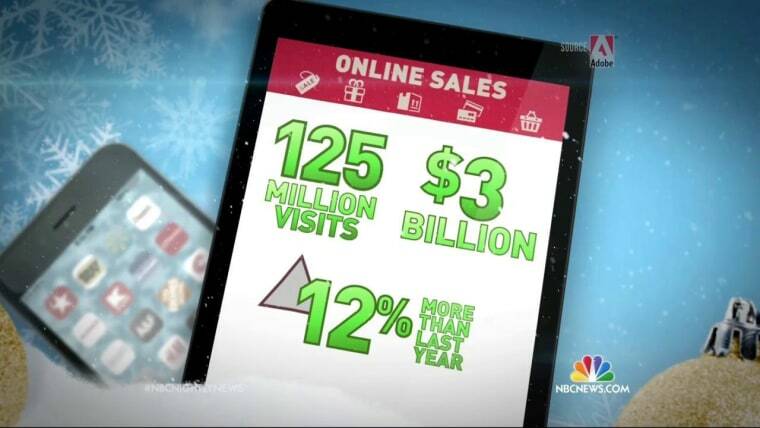 This year's "Cyber Monday" is set to be the biggest online shopping day in history, Adobe predicts. With data from thousands of retailers still flowing in, the company believes Monday's total online spending will be $2.98 billion. That's an improvement over last year's $2.65 billion, and a shade higher than the estimated $2.74 billion spent on Black Friday — which has been increasingly shifting online to avoid the inevitable lines and conflicts that plague in-store deals. Internet shopping was up 17.8 percent over Cyber Monday in 2014, according to IBM data, and more people were deal-hunting using their smartphones. Sales over a mobile device ticked up almost 26 percent from last year, to make up more than 27 percent of all online purchases. Adobe said 4K TVs, new gaming consoles and iPads big and small were the top-selling electronics, and LEGO dominated the toy sales. The average order was $133, according to the data Adobe collected, and over a quarter of those sales were done on phones or tablets. "Online traffic was so astronomical that several retailers experienced temporary outages and slow checkouts, but that didn’t stall consumer spending," Tamara Gaffney, principal analyst, Adobe Digital Index, said in a statement. Adobe arrived at its predicted figures by analyzing data of more than 125 million visits to 4,500 retail websites.